We started the day at the Deep Cove Kayak Centre. Weather wasn’t too promising – there was considerable overcast, and a good chance of rain. As I’ve learned, this is great weather for paddling. 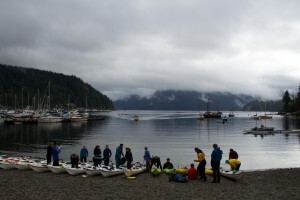 With the help of the super-nice staff from Deep Cove Kayak, we got geared up and oriented with the boats in an incredibly short amount of time. By 10:30 we were already on the water, paddling away. The views were unreal; calm glassy sea, overhanging mist on the mountains, and the sound of paddles passing through water. Beautiful waterfalls lined the shore (some fearless paddlers took a ‘shower’ underneath them), and trees surrounded us from all sides. Couple hours into the trip and we were met with thunder. Rain started coming down in buckets and, after hearing some tenacious roars, we decided to retreat to shore and let the storm pass (Good call Krista!). 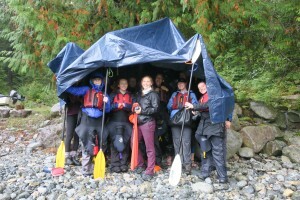 We all huddled together underneath one large tarp that was make-shifted into a sort of shelter supported by kayak paddles. We shared the rest of the doughnuts, Krista brought out a pumpkin loaf, and some hot tea was passed around. Some pizza might have even circulated the crowd. It was a great time to learn some new things about other group members (Joey had a particularly interesting story about his toe) but what happens in the tarp stays in the tarp, so I’ll leave it at that. After the storm passed we climbed into our boats again and paddled for an hour more or so, until we got to Granite falls, our campsite. The water fall was pretty rad! We didn’t stop at the campsite though – we decided to paddle just a bit more and continued to the Estuary just two kilometres ahead. After paddling back to Granite Falls we set up camp. 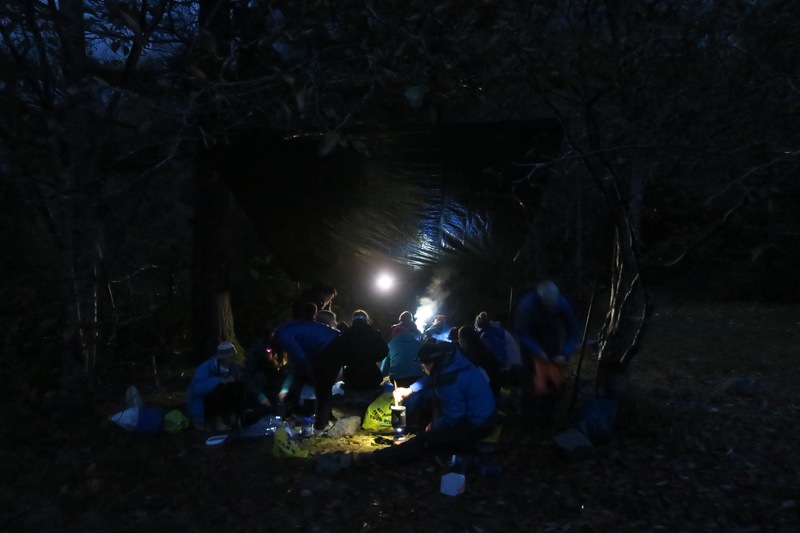 We sectioned off an area for the kitchen (accomplished by, again, tying paddles to a tarp and standing them up) and heated up our stoves for dinner. After that was the dessert potluck. It was one of the best parts about this trip; I don’t think I have ever consumed that much sugar in such a short amount of time before! Everything tasted really good, but food always does after a long day of paddling. With that we concluded our first night of the trip. 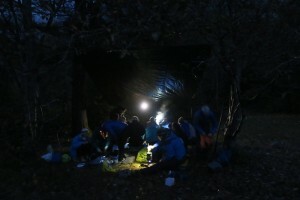 The weather was mild, and I can say I was comfortably warm in my tent. Best sleep I’ve had for weeks. We woke up early (7:30-ish) the next day to eat breakfast and pack up camp. The morning went smoothly and by 9:30 we were on the water paddling again. 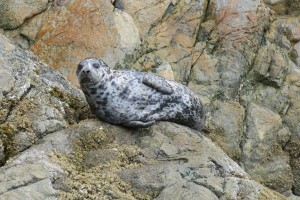 On the trip back we saw seals swimming and laying on the rocks (my first time ever seeing one! ), and herons and seagulls flew in and out of our path. 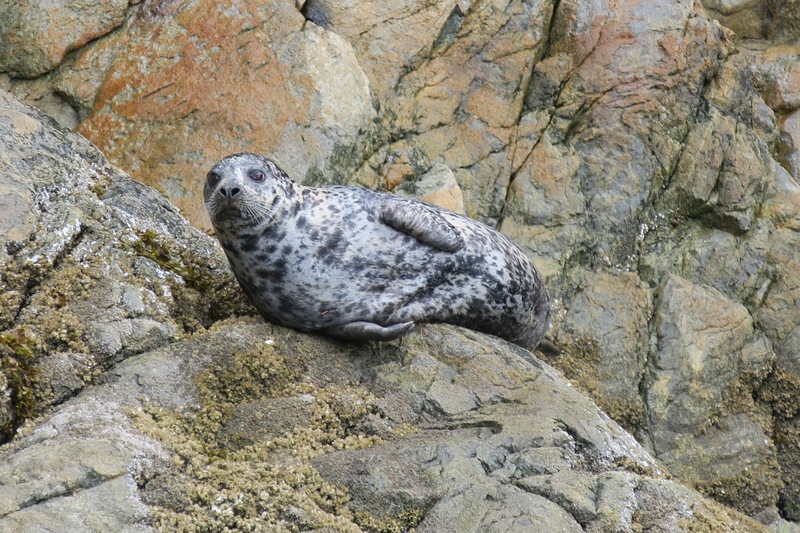 Sea kayaking is definitely the best way to see marine wildlife. We also found a new sea cave! 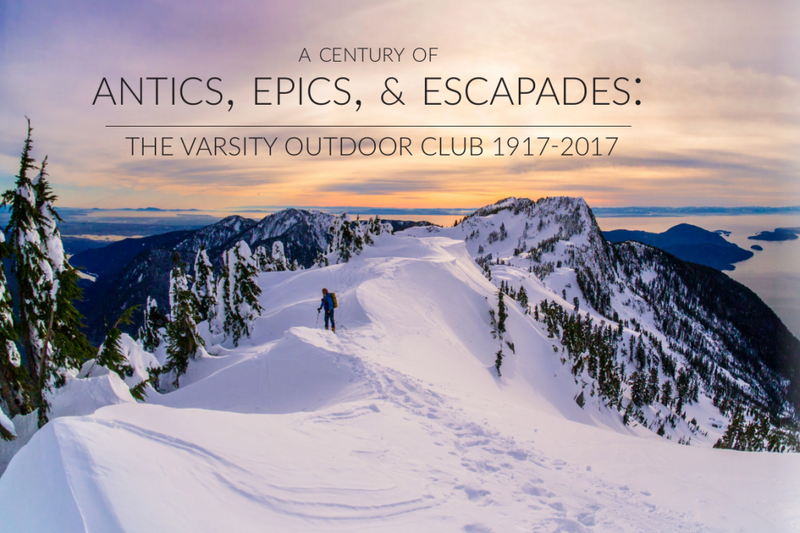 Never before explored (by us), it was an exciting feature to add to the trip. As we approached Deep Cove, Krista pointed out some pictographs on the rock face. The trip concluded with sore arms and wet feet, but it was an awesome first trip with the VOC. I’ll definitely visit Indian Arm again and I highly recommend others go on this trip, even if it is just for the maple glazed doughnuts from Honey’s. This years annual Indian Arm Kayak Trip was led by Krista Cawley. Huge thanks to her and the other VOC members for organizing this trip! 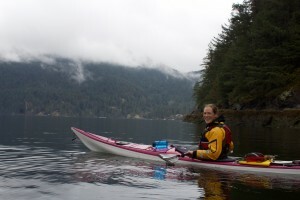 This entry was posted in Paddle, Trip Reports and tagged First-Trip, Indian arm, Kayak. Bookmark the permalink.